1. In a digitized world, data becomes the most important production factor. The diversity and exponential growth of digital data in business, medicine, mobility and many other areas of everyday life, together with new methods of artificial intelligence, offer an unprecedented "treasure trove" for the automated recognition of new patterns and correlations, the generation of early warnings or the control of processes. Unlike us humans, machines can learn from large data streams in real time and help us to master the new flood of data and information and to put it to productive use. The quantity and quality of the data determines the possibilities and powerfulness of machine learning the AI methods and applications. The cycles and costs in which entrepreneurs, doctors, lawyers, scientists or citizens can better understand important interrelationships and learn new insights about their domain of expertise have been drastically reduced thanks to new data sources and novel AI methods. The speed at which knowledge is generated from data has become more than ever a decisive competitive advantage. 2. Data sovereignty is a critical success factor for digital competitiveness. If data and data analysis skills are the production factor of the future, then data access and data competence are the key factors for future competitiveness. Unfortunately, Germany has fallen behind in both of these aspects. Computer science and Data Science are becoming the basis of all other scientific subjects such as Physics, Chemistry and Economics; their significance is comparable to that of mathematics. The expansion of computer science education in schools and universities is thus the most important key to future viability. The education must not be limited to the mere application of systems or application programming, but must focus on the algorithmic handling of data. At the same time, further education in data sovereignty must be seen as a national challenge for the entire population. In order to achieve data sovereignty, Germany and Europe do not just need the next supercomputer. In Addition, we need a sustainably (and publicly) operated data infrastructure in order to democratize access to large, high-quality data sets (Internet, research data, public data e.g. mCloud) as well as their analysis and visualization in real time for schools, universities, research institutions and citizens. Only in this way can we create a gap to the monopolized data collections of American IT companies or the state-regulated access to data in China. Such a central, national, generally accessible infrastructure should not only provide data continuously in real time, but also provide tools of the entire data value chain (curation, analysis and visualization)in an easily usable manner (web-based) and automatically generate new knowledge graphs from its use, thus fueling research and innovation in data-driven applications. Such a data infrastructure must not be limited to the provisioning of compute power or data collections, which are usually hardly curated and difficult to access, but must provide easy access to data and modern hardware such as tensor processors. 3. Top scientific research is the result of critical mass and continuity. The success of many American IT companies has its origins in the leading research groups and institutes at American elite universities. Germany, on the other hand, has a very widely dispersed and broad range of scientific competence in the relevant research areas. The bundling of scientific competence in national competence centers, e.g. the BMBF competence centers on security, big data and machine learning, is therefore the right step towards increasing the efficiency and effectiveness of scientific research. Many innovations (Spin-offs and various scientific innovations) have already emerged from the research of the current competence centers. In order to retain talents and ensure continuity in research, these centers should be further expanded and transitioned to a permanent structure. Otherwise, the competence clusters which have been established with a lot of effort may disintegrate and disperse. In particular, these scientific disciplines should be expanded rapidly and with internationally comparable funding and critical mass (about 20-30 more than before). A significant expansion of professorships in the fields of machine learning, AI and big data seems essential in order to cover the significant demand for graduates by academia and industry. In particular, the young scientists involved in these centres should be given the opportunity to continue their successful work within the framework of Tenure-Track. Otherwise they will literally be forced to emigrate to industry or abroad. It would also be desirable to enable applications and reporting to be submitted to the BMBF and BMWi in English, in order to enable international top talents to work in a reasonable manner in Germany. Like the economic landscape in Germany, the scientific landscape in Germany is very decentralized in comparison to many other countries. This makes it all the more important that this scientific landscape is strengthened by a common communication and networking platform. 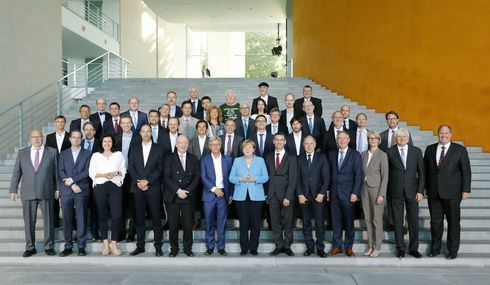 For digitization, machine learning, AI and Big Data as a whole, a forum should be continued and strengthened in the long term, which promotes scientific exchange, demonstrates important technological innovations at one central point, acts as the common voice of German technology research abroad and coordinates the transfer to SMEs. The Smart Data Forum, funded by the Federal Ministry for Economic Affairs and Energy and successfully established in cooperation with the BMBF, could serve as a model and a starting point. The Smart Data Forum not only brings together the competence centers, technology programmes and innovation labs and accompanying research on Big Data in Germany, but also initiates important partnerships with China, Japan, Singapore, Qatar, Great Britain, France, Finland and other countries in important areas of research and innovation. Die Bundeskanzlerin hatte zu dem Gespräch Fachleute aus Hochschulen, Forschungseinrichtungen und Unternehmen eingeladen. Seitens der Bundesregierung nahmen neben der Bundeskanzlerin der Chef des Bundeskanzleramtes, die Bundesministerin für Bildung und Forschung, der Bundesminister für Wirtschaft und Energie, der Bundesminister für Arbeit und Soziales, der Bundesminister für Verkehr und digitale Infrastruktur sowie die Beauftragte der Bundesregierung für Digitalisierung teil.